The Bucks made one thing clear in their firing of Jason Kidd: OK isn't good enough. With Giannis Antetokounmpo in his prime, the Bucks are hoping they can lure an A-list coach to Milwaukee. The Milwaukee Bucks sent a pretty clear message with the decision to axe head coach Jason Kidd on Monday: there is urgency and there are stakes this season. ESPN’s Adrian Wojnarowski first reported the news, with assistant coach Joe Prunty set to take over in the interim, beginning with Monday night's tilt against the Suns. After losing four of five games (and seven of their last 11), the Bucks fell into No. 8 in the East entering the week, and it appears team ownership ran out of patience. 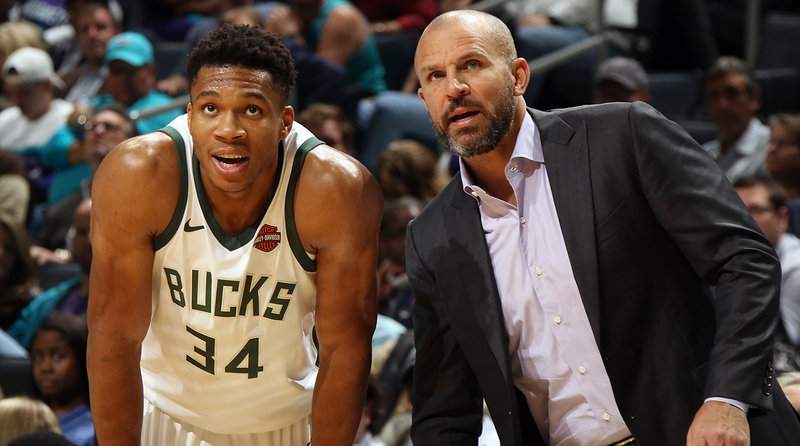 Between Kidd’s history of tumultuous relationships with employers and Milwaukee’s desire to win now, the Bucks will attempt to right things in the short-term, and present themselves as a highly attractive coaching destination this summer. This is life when a 23-year-old NBA superstar blossoms in a small market. Last year, Giannis Antetokounmpo signed a massive extension through 2021, but in reality, his long-term recruitment is an everyday process. The Bucks are in an enviable position with a potentially generational talent on board, although there may be some explaining to do: ESPN’s Chris Haynes reports Antetokounmpo was "devastated" by the news, which went public before the coach was informed. In an era where players hold bargaining power and stars have chosen to team up, there’s an added onus for organizations that lack traditional, major-city recruitment tools to compete and stay on the cutting edge. Reading the tea leaves, Kidd’s sudden firing falls in line with that philosophy. “We believe that a fresh approach and a change in leadership are needed to continue elevating our talented team towards the next level, bringing us closer to our goal of competing for championships," said Bucks General Manager Jon Horst in an official statement. He cited Kidd’s worth to the team over the years, but expectations can change quickly in the NBA, and rumors trickled out in recent months that the team had begun to lose some patience. Wojnarowski echoed that, listing the recent stretch of losing and "frayed relationships in organization and general non-alignment" as the rationale. Milwaukee traded for Eric Bledsoe early in the season and has successfully surrounded Antetokounmpo with quality core talent. But Kidd had publicly attempted to lower the hype level this season as the team struggled, frequently citing youth and inexperience. Kidd, 44, went 139–152 over three-plus seasons with the Bucks, including two first-round playoff exits. The future Hall of Famer joined Milwaukee in 2014 amid controversy over reports that he’d engineered an exit after a failed play for executive control in Brooklyn, where he made his coaching debut the previous season. He was at the helm when the Bucks chose to turn the keys over to Antetokounmpo as lead ball-handler, which has been a rousing success in the context of his development. The team dealt with injuries and slipped heavily defensively en route to its current 23–22 mark, and if social media is any tell, a section of the Milwaukee fan base had begun to grow uneasy. The Bucks have been tied to DeAndre Jordan via trade rumors and are, for all intents and purposes, moving aggressively, although a major leadership change could certainly affect that. After the team couldn’t agree to a long-term extension with Jabari Parker, the gifted yet injury-prone forward could be a name to watch in trade talks as he nears restricted free agency and a return to the rotation. The Eastern Conference has been competitive this season, but beyond the usual suspects it has lacked a convincing middle tier, leaving room for Milwaukee to put together a run and re-energize a playoff push. Can the Cavs Make a Move That Matters? Prunty, who was with Kidd in Brooklyn and filled in as interim coach for the Milwaukee during the 2015-16 season while Kidd recovered from hip surgery, will have a rosy slate of games to turn this around: the Bucks get the Suns, Nets and Bulls this week. But beyond the next few months, the future of the seat is unclear. After all, who doesn’t want to coach Giannis? The Bucks are betting on their charismatic young superstar for leverage in the forthcoming search, which feels like a strong gamble. Proven head coaches like Monty Williams have already popped up in reports. Milwaukee’s new downtown arena and facilities will open next season, and ownership has spent aggressively to revitalize the franchise in recent years. They should have their pick of experienced coaches at season’s end. In keeping with the team’s decision-making history, parting ways with Kidd signals no shortage of intent.